Luxury apt, close pool on Polaris World's La Torre Golf Resort. Our luxury Spanish apartment on the elegant La Torre Resort is perfect for golfers and families. Large south facing terrace for barbecuing and sunbathing with direct view of beautiful resort pool. Mini market, 4 on-site restaurants, bars all within 5 min walk. 2 elegant bedrooms (one double, two singles - inc a/c), sleeps 4. Mod, fully equipped kitchen. Sunny, airy lounge with big homely sofa, LCD TV, sattellite channels, DVD, CD player. Free Wi-fi!! La Torre is a secure 'gated' golf resort safe for families with 12 communal swimming pools, tennis and a 5 star Intercontinental hotel near an elegant Clubhouse. Guests have access to the Resort's 18 hole Jack Nicklaus golf course and the courses of Mar Menor, El Valle, Mosa Trajectum, Torre Pacheco,La Finca , Las Ramblas and La Manga are all within a short drive. Medieval Murcia, a 30 min drive, has night life, shopping and restaurants and the historical city of Cartagena is also just 30 min drive away. Diving, sailing, wind surfing, cycling, horse riding, paragliding all available locally. Terrace: has a luxury all weather garden table with seating for 4 together with removable cushions and two matching comfortable loungers and a sun umbrella. Also, a large Weber grill with cover and barbecue utensils. The Terrace is on the first floor. Provided: Linen, towels (not for use on beach), sunbeds, air conditioning, central heating, iron and ironing board, hairdryer. Living room sofa has been especially chosen for its bright modern but homely appeal. It can seat 5 and is wide enough to sleep a teenager at tenant's own risk. Variety of sports on the family friendly Mar Menor with its shallow warm waters. Punjabi, wife, mother of three adult children. Work as a consultant. Love family time, travelling, sports: skiing, fitness, eating, wine, concerts, cinema, opera. Never bored. Addicted to news and sweets. We love that Murcia is still relatively provincial and not too commercialised. The people are great and local fish, tapas and wine are high quality but still quite cheap. Murcia has over 300 days of sunshine a year so great in May and in October! Aside from walks around the golf course and tennis we enjoy discovering local beautiful white sand beaches. We love the size of our terrace and its views over the community pool and the quad. Cartagena and Murcia for their history, architect and abundance of good value restaurants. We especially enjoy the mud baths at San Pedro Del Pinatar and watching the wind surfers on the Mar Menor. Modern, well lit bathroom with overhead shower and protective shower screen. Large wall rack for towels. Pool tables in the bar area nearby. Hard courts on the resort. Need car. Balcony is spacious. Furniture bought with elegance and comfort in mind. Two matching comfortable all weather loungers and sun umbrella on stand. Large Weber grill with cover and barbecue utensils. Provided: linen, towels (not for use on beach). Sunbeds for balcony, air conditioning, central heating, iron and ironing board, hair dryer. Living room sofa has been especially chosen for its bright, modern but homely appeal. It can seat 5 and is wide enough to sleep a teenager at tenant's own risk. Other activities: variety of water sports on the family friendly Mar Menor with its shallow, warm waters. Water parks in Alicante. Looked after really well from start to finish by the owner. Great apartment located close to the bars and restaurants on site. The whole area is clean and well kept. Would recommend this apartment to friends and family without hesitation. My husband and I and our two boys (aged 15 and 11) have just returned from a 2 week holiday at this beautiful apartment owned by Jas. Prior to the holiday Jas communicated regularly by email and always responded quickly to answer any questions I had and even during our holiday she emailed to ensure we had everything we needed and gave us useful information, which was extremely helpful. The apartment itself was fantastic and decorated to a high standard with modern furnishings and everything you would need, our boys were particularly pleased to have super fast wifi! The highlight of this property is the wonderful private terrace with full awning meaning you can sit out there all day overlooking the pool out of the full glare of the sun - essential during the August heatwave!! There is also a useful underground car park with a lift which takes you directly to the apartment which is perfect for keeping the car out of the sun during the day. I would say it is essential to hire a car during your stay as there are some lovely towns and villages to visit. We particularly liked Cartagena, Los Alcazares and Torrevieja which all had a good choice of restaurants. There are a couple of restaurants on site within easy walking distance, and we visited the Italian restaurant several times (you need to book though) and the food was excellent on every occasion and very reasonably priced. There is a supermarket on site, again only a 5-10 minute walk away, which stocks a good range of food also competitively priced. There are lots of pools on the resort but we only visited the two which the apartment overlooks. These are beautifully kept and surrounded by immaculate gardens with plenty of shade from trees if you need it. The pools are cleaned every morning and were always spotless. I would highly recommend this apartment if you are looking for a quiet and relaxing spot for a holiday. We stayed at this property in early May with our two year old daughter. The property is in a quiet part of this large resort within excellent walking distance to the main amenities (shop, restaurant and club house). There is secure access to the property and a lift which we found very helpful with a buggy in tow. The property is in excellent condition and has all that you will need for a comfortable stay. We didn't require any air conditioning but appreciated the ease of electric shutters. We made full use of kitchen and bbQ during our stay which was more than adequate to prepare family meals. The big plus on this property for me was the fantastic private terrace with awning. We were able to stay outside all day with our little girl who was enjoying the heat but have plenty of shade too. Our little girl loved the baby splash pool and small park in the main garden of the complex which was just a 200m from the front door. Important for those wanting a quiet holiday this was a very peaceful garden and only a few children were out and about at any one time. Would highly recommend this property for those wishing a quiet relaxing break. Dear Jennifer, thank you very much for the lovely and thoughtful review. We are delighted that you could enjoy the fabulous terrace and new awning and hope you will return next year! Nice and large apartment, well equipped and very clean! Large terrace with a view on the pool. We stayed for 11 days and had a great time. Just back from a great relaxing break staying in this apartment. It has everything you could possibly need. The big balcony is great for sitting chilling on an evening and having brunch in the sun! The whole la torre complex is lovely and well kept. Jas the owner was very helpful giving us loads of info prior to leaving and answering all out queries both before and during our stay. We will definitely be back again. My wife and I took our two girls (10 & 6) to this lovely apartment owned by Jas and spent a fantastic 9 days at the resort. 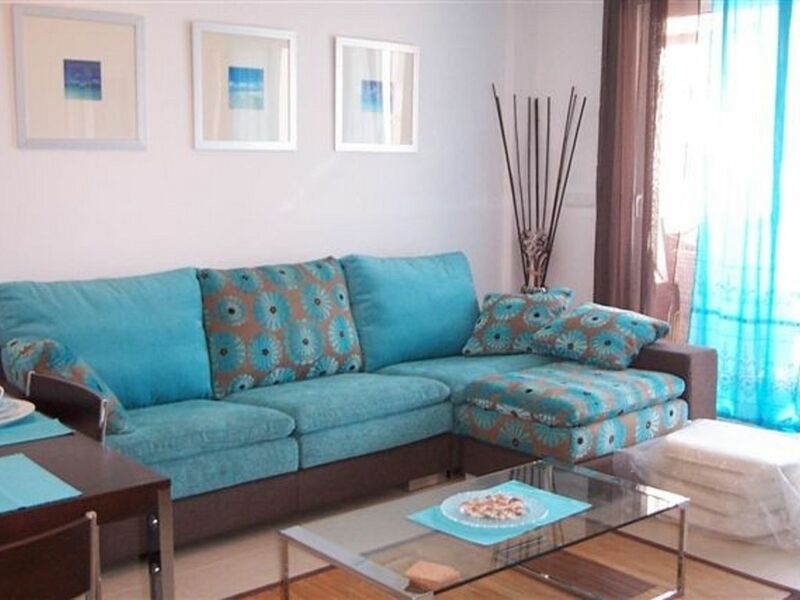 The apartment itself was fantastic and decorated to a high standard with modern furnishings. The sofa was extremely comfortable too! There is also an underground car park with a lift which will take you to the apartment. Be warned though, you will definitely need to hire a car whilst you are here. Los Alcazares is lovely town which is about 15 mins drive from the resort. It has some fantastic restaurants and I would highly recommend, The Last Mediterranean Gastropub. The quality was simply outstanding! There are also some restaurants on the resort although you will have to book in advance if you want a table at the Italian restaurant. There is also an Irish bar and a Tapas bar too which are only a few minutes walk away. Murcia and Cartagena are around 25 minutes drive and well worth a visit! There are two large pools and two baby pools located next to one another with a jacuzzi pool also. The grounds are spotless and maintained every day with guards paroling regularly. I would highly recommend this apartment for a fantastic holiday! Welcome to Murcia - rugged mountains, lush green fields, golden sandy beaches and crystalline waters. Murcia is the real Spain in customs and climate. Murcia enjoys an annual ave. temp of 20ºC and nearly 3000 hours of sunshine. Murcia is caressed by the waters of the Mediterranean and the Mar Menor, a great salt water sea lagoon, with its salt marshes, ecosystems, islands and unique flora and fauna. The Costa Calida (warm coast) is the name given to the 155 miles of Murcian coast which stretches from the natural salt lagoon of the Mar Menor in the east to the fishing town of Aguilas in the west. The two seas offer sparkling waters, luxuriously long and sandy beaches and enchanting bays. With a variety of Blue Flag beaches to choose from on the Costa Calida, just minutes from La Torre, you can be assured of a relaxing holiday. Granada and the Alhambra Palace is a 2 h drive and vibrant Madrid 3.5 h. Alicante with its popular water and theme parks is just 45 min. Please note: the owner of this property accepts payment in GBP, EURO, CHF, HKD before use of conversion tool. The conversion tool is provided for your convenience only. The owner may accept other currencies if specifically agreed in advance. **Booking notes: 50% of rental is required to reserve the apartment. Balance plus deposit of £80.00 per stay for potential damages payable 60 days before commencement of stay.